Ben joined our team as a Marketing Specialist in January 2018. Ben graduated Penn State University with a Bachelor's degree is Cinematography and Film/Video Production in 2017. Since graduating he has worked in several different marketing positions before joining SNI. He is looking forward to lead our efforts in marketing communications as we grow. Hannah joins us as a part-time intern. She is currently enrolled at PSU’s Smeal College of Business with a major in Marketing and a minor in Digital Media Trends and Analytics. Hannah will graduate in May 2020 and after graduating is considering staying on the SNI team as a full-time marketing/communications employee. 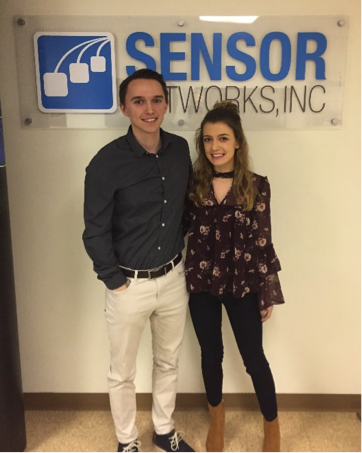 Ben and Hannah have joined our team in effort to help us increase SNI’s awareness in the global markets that we serve for testing, inspection and asset-integrity solutions. Please welcome Ben and Hannah to the SNI family. They can be reached at: lapp@sensornetworksinc.com and deal@sensornetworksinc.com.